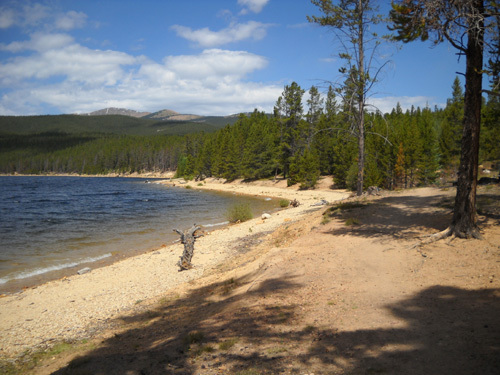 In this entry I'll show photos of some of the trails where Jim and/or I have run/hiked since our arrival in the Leadville area on August 9. Since Jim didn't carry a camera on any of his runs there are no pictures from the sections I didn't cover. That's most of the places he went! 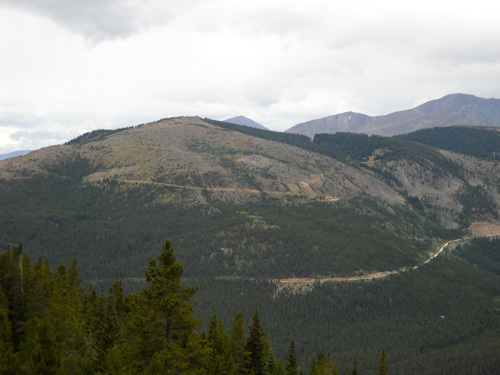 To see photos of Hope Pass, Clear Creek, Twin Lakes, the Colorado Trail sections, Half Moon Road, and Sugarloaf Mountain, see our 2006 and 2007 journals. I missed all those places this year because I've been recovering from my nasty bike wreck three weeks ago.. 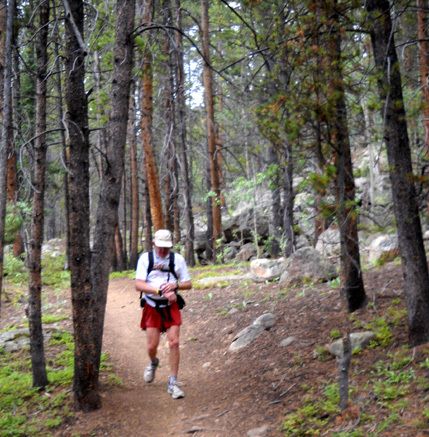 Most of Jim's miles were on the LT100 Run course. He ran all of it one or more times except the south side of Hope Pass to Winfield and The Boulevard to the start/finish. Those two- to three-mile road sections are our least favorite parts of this course. Why run them when neither of us is entered in the race? 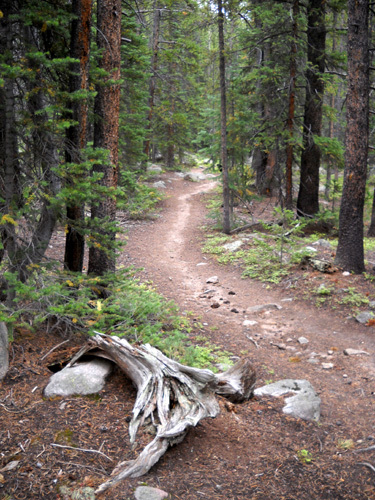 Once I resumed real aerobic outdoor exercise on August 13, ten days after my bike crash, I stuck to either the paved Mineral Belt multi-use trail that circles Leadville or the undulating, non-technical, single-track dirt trails around Turquoise Lake. "Closed to motor vehicles, motorized equipment, hang gliders, and bicycles." Hang gliders??!! It's a long way to carry one of those to the top! And now that we're leaving town today, I finally feel like I'm ready to climb to Hope Pass or the summit of Mt. Elbert. <sigh> I'll have to find some mountains to climb in Utah and Wyoming in the next few weeks! 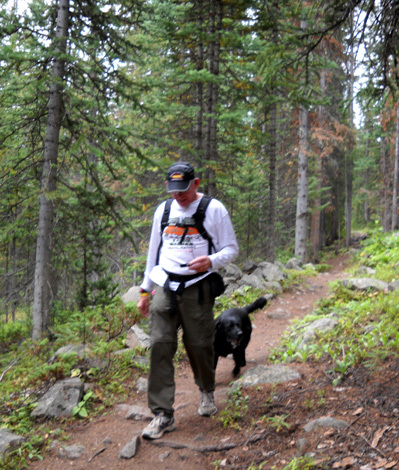 Jim is nearing his peak training for The Bear 100, which he decided about three weeks ago to enter. On training runs in late July in the Silverton area, Bill Heldenbrand convinced Jim that he still has the ability to finish hundred-milers. I agree, but motivation is also imperative and Bill helped fuel his desire again. Although Jim held fast to his affirmation of "no more 100s" longer than ever before, I wasn't the least bit surprised when he said he wanted to run The Bear on September 25. Atta boy! That's my Jim! 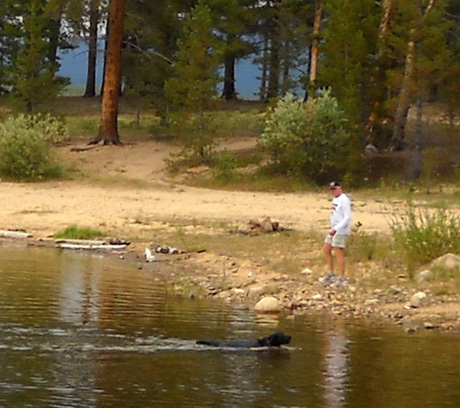 He also decided that the Grand Teton 50-miler on Labor Day weekend would be a good build-up for The Bear. 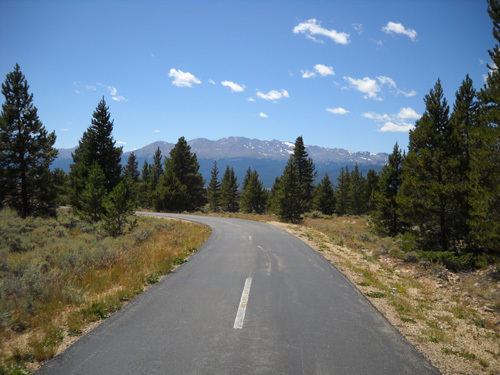 Four 25-mile loops on the course in the 100-miler are quite a challenge, but two loops are reasonable. You'd have to run the Teton course to fully understand the mental and physical strength it takes to do a full hundred miles there, despite the seemingly-generous 36-hour time limit. 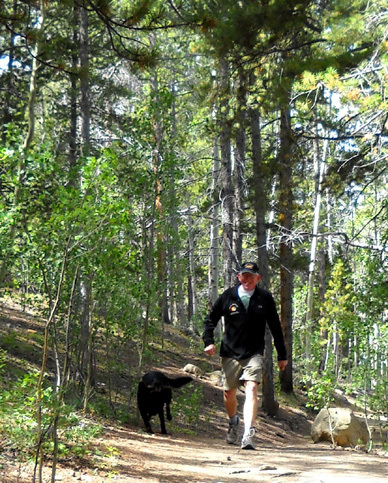 After some recovery from July 18's Tahoe Rim Trail 50K, Jim began ramping up his mileage again to a high of 58 miles the week of August 8-14. 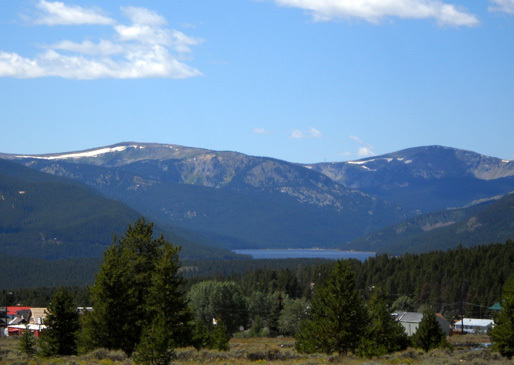 The next two weeks were/will be a little lower because of our volunteer commitments in the Leadville bike race and run. He plans to increase the length of both his long runs and weekly mileage in the next month, with some tapering before The Bear so his legs will be fresh for the race. 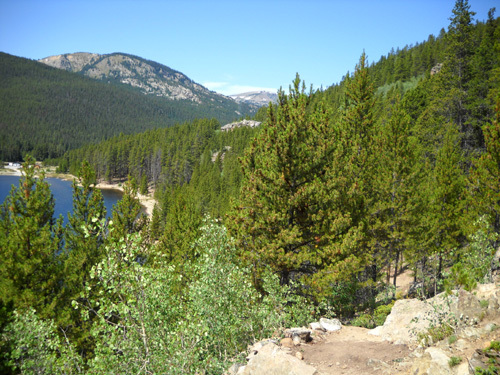 Jim has enjoyed near-daily runs around Turquoise Lake, over Sugarloaf Mountain, near the Fish Hatchery, on Half Moon Road, on the Colorado Trail to Twin Lakes, and up the north side of Mount Hope to Hope Pass. He also did a 10-mile run one night on the Mineral Belt Trail to remind himself what it's like to run in the dark. I was doing great this summer until my bike crash on August 3. I ran and walked 147 miles in June (from 26-48 miles/week) and 167 miles in July (23-49 miles/week) -- almost all at rather high altitudes and on mountainous terrain. Even though I don't have any late summer or fall races planned, I wanted to maintain my mileage base and fitness level. I also wanted to simply enjoy the mountains. That came to an abrupt halt three weeks ago. I took ten complete days to rest after the wreck. 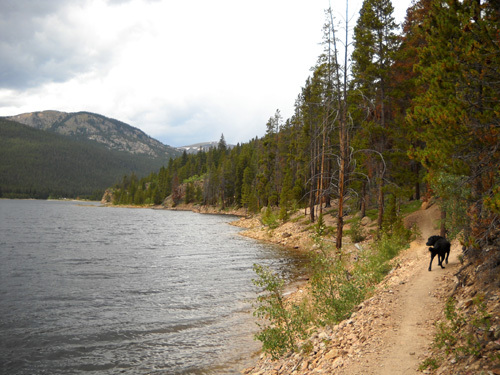 My first real walk came on August 13, when Jim, Cody, and I walked about three miles around Leadville. I'd been so sedentary and sheltered cooped up inside that it was a little disorienting at first to be outside. But as long as I didn't breathe too heavily or run downhill on pavement the first week back outside, my ribs and head felt fine. I continued increasing the distance, time, and difficulty of my walks gradually, going from 14 miles that week to 24 this past week. The mileage would have been higher if I hadn't been as busy both race weekends. I'm aiming for at least ten more miles this week. I've also begun to run some of the distance. It's a disappointment that I haven't been able to run and hike my favorite parts of the LT course (Hope Pass, Colorado Trail to Twin Lakes) and any of the local 14ers this year, but I'm lucky to be able to walk and run ANYWHERE right now. 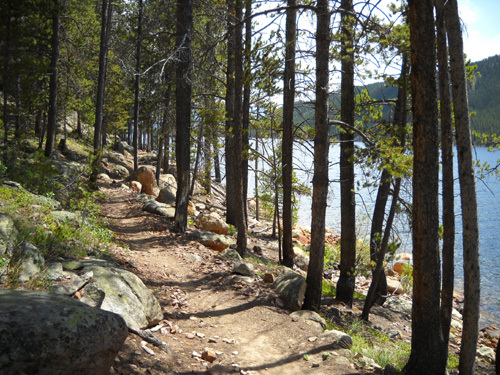 and the very pleasant, rolling single-track around Turquoise Lake. 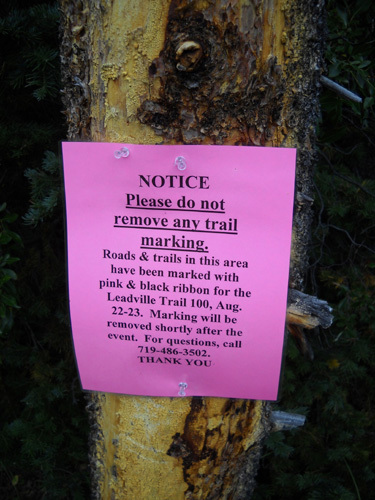 It was a nice summary of the Leadville course. 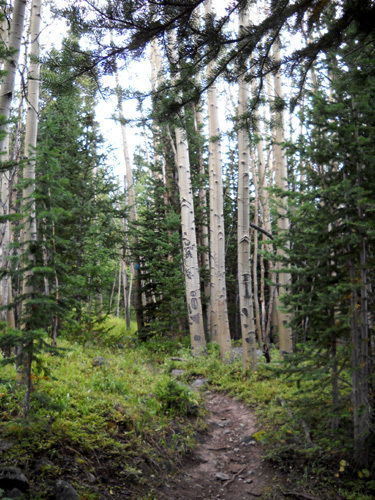 I'd been itching to get on the Colorado Trail. 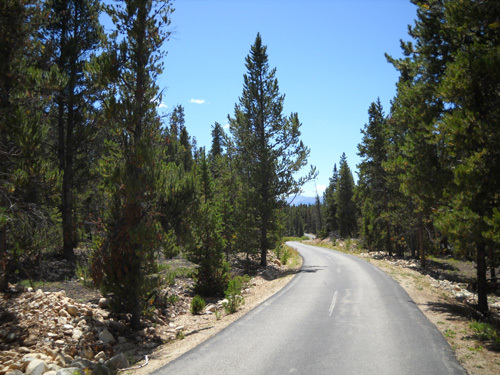 We didn't want to waste time driving out Half Moon Road and possibly getting turned around again, so I went north on Segment 9 of the CT from the Timberline Lake trailhead near Mayqueen. 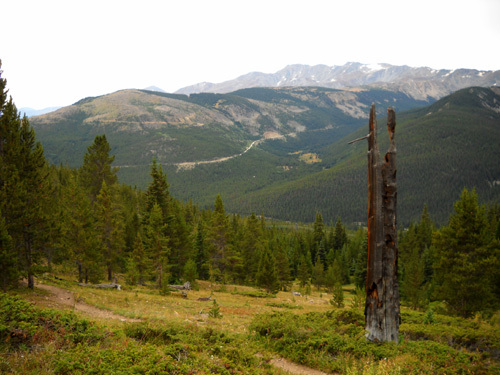 The Leadville course goes through that parking area but runners head the other direction on the CT in the race. 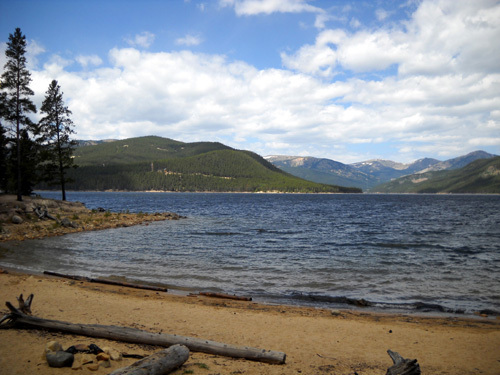 I dropped Jim off at the fish hatchery, then drove to the Timberline Lake trailhead and left the truck there for my out-and-back hike up/run down the Colorado Trail. The parking area was about halfway through Jim's point-to-point run, making it handy for him to get more fluids if he needed them (there are also water spigots in the Mayqueen campground and two boat ramps around the lake). 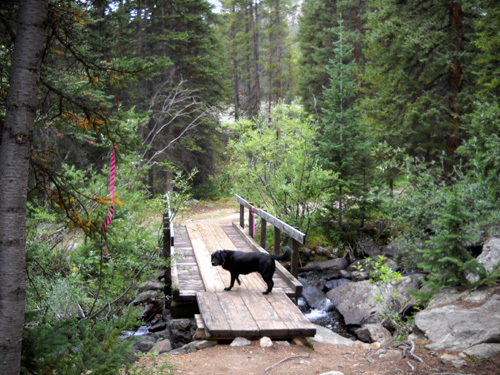 Cody and I happily headed up into the Holy Cross Wilderness for the best run/hike I've had since my bike wreck. 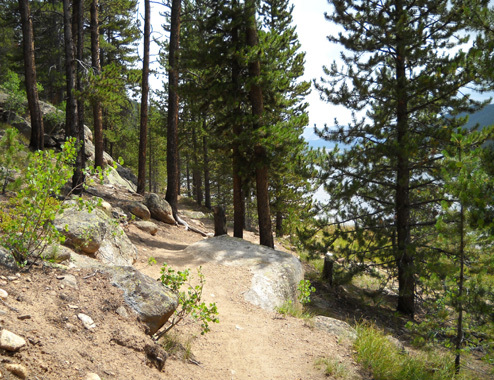 I climbed from 10,040 feet at the trailhead up to a high point on Galena Mtn. at 11,150 feet, down the other side a bit, and back to the trailhead, a total of about five miles -- nothing epic, but a good start. 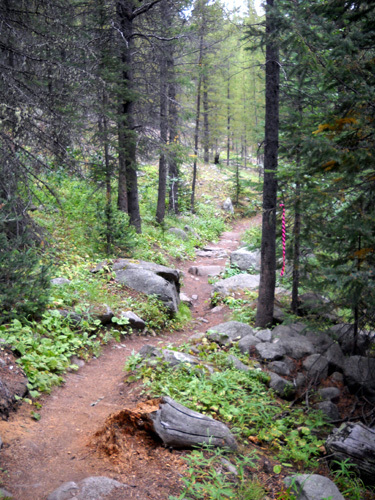 Since running this segment southbound three years ago, I'd forgotten how rocky the single-track trail is. I was in better shape them and not as afraid of falling then as I am now. 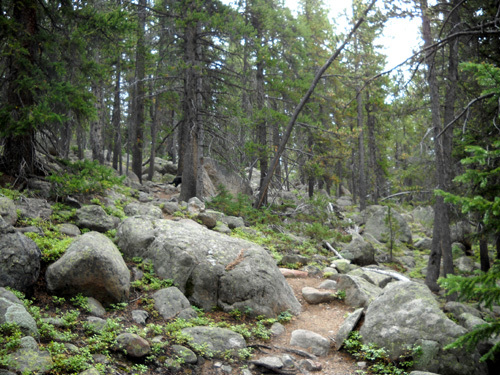 Since it was my first real mountain foray since the concussion three weeks ago, I was careful through the rocky parts. I really enjoyed all the boulders on the mountainside about halfway up (next photo), especially since I didn't have to climb over any of them, just around them. 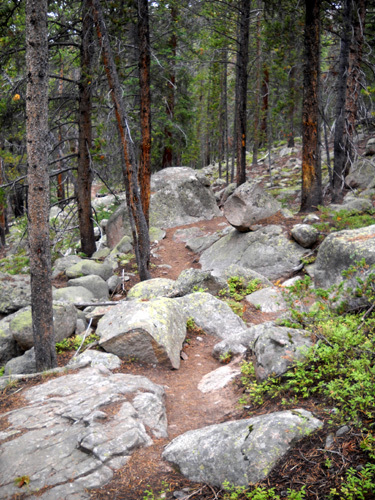 The trail was much smoother on the switchbacks near my highpoint today. I don't feel like I've lost any altitude training, although I've definitely lost some of my leg strength in the last three weeks. 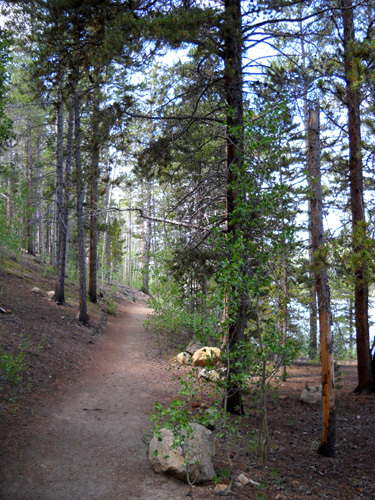 I walked carefully as I ascended the trail, not only to avoid falling down but also to monitor my ribs and lungs. I've read that it takes from three to nine weeks to recover fully from rib fractures; strenuous exercise is not advised. Although the left side of my chest still feels funny right after I lie down on my back in bed (it's OK after a minute or less), it didn't hurt at all as I climbed uphill and ran downhill today. 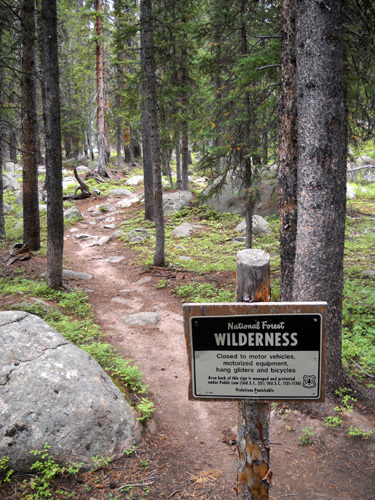 On all of our runs and hikes in the Leadville area it's been very obvious that the wildflowers in this area are nowhere near as prolific as they are down in the San Juan Mountains of southwestern Colorado. The few that are blooming near Leadville are beginning to wilt from lack of rain. We haven't had near as many afternoon storms this month as we usually do when we're visiting the area. There are great views of the LT course up Hagerman Road to the pass from Galena Mountain (next two photos) Both up and down, I stopped several times to peer closely across the valley, trying to see if I could spot Jim running down the road. I was either too early or he was hidden by trees when I was looking for him. 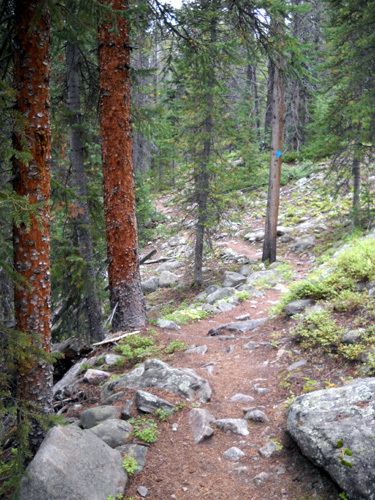 Oddly, there are no views of huge Turquoise Lake from this segment of the Colorado Trail, and not many good ones from Segment 10, either. 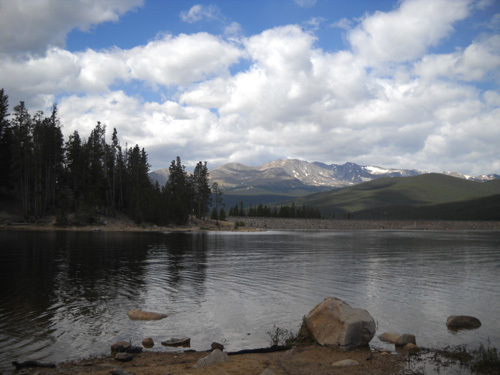 Even though it was increasingly overcast and looked like it might rain, Jim continued on another 7+ miles to the dam. 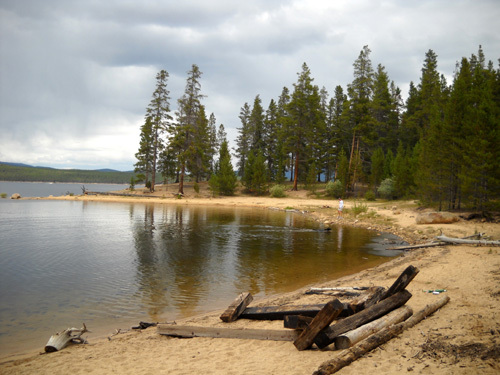 The lake is very picturesque even on a rainy day. 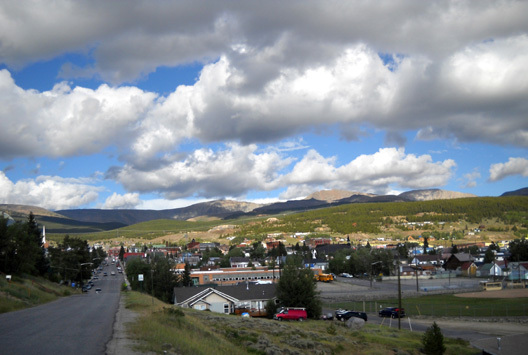 We left Leadville this afternoon with mixed emotions. It was great to see our friends, but now that the race is over they're gone and it won't be as much fun to hang out there. The same thing happened after the Hardrock race. 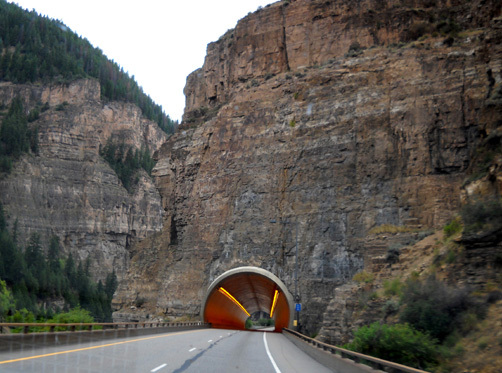 Although Jim could continue training in the area, we've decided to head to northeastern Utah for a week so he can check out some of the Bear course. It has changed significantly since he last ran the race in 2003. We said goodbye to Jack, our gracious "campground host," and gave him a thank-you card with a gift certificate for fuel at his favorite gas station. It was great to talk with him periodically and to have a quiet, shady place to park with water and electric hookups for two weeks. We pulled out of his back yard about 3:30 PM, paid a visit to the dump station at the Leadville Sanitation Dept. 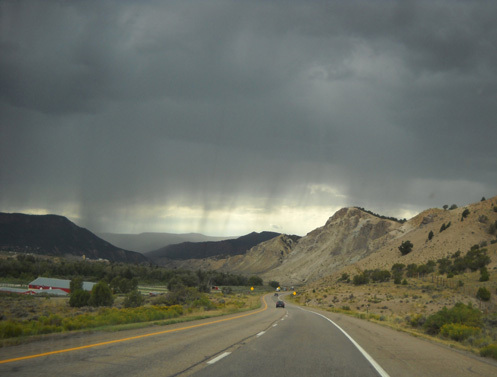 to get rid of accumulated black and gray water, and headed northwest to Grand Junction, CO, where we will stay the night. 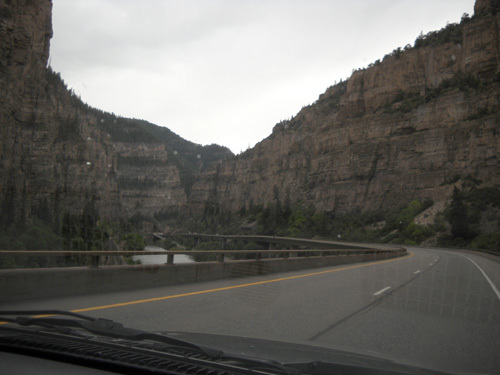 West of Glenwood Springs the terrain morphs from mountains to mesas as the freeway follows the Colorado River most of the way to the Utah border. Our destination for tonight was Sam's Club on the west side of Grand Junction. We were happy to find diesel at their pumps for $2.54, about ten cents less than in Leadville but still high by national standards. We liked parking overnight here in July when we were on our way from Silverton to Reno. We were able to get the same spot this time at the remote end of the parking area next to a wide swath of cool grass for Cody to enjoy before the deluge of rain arrived. While I loaded up on supplies at Sam's, Jim headed across the street to get something at WalMart. He found a great little Thai restaurant and brought back two delicious dinners that we enjoyed in the camper. He almost got back before getting drenched in some heavy rain . . . Tomorrow we'll drive the rest of the way to the Logan, UT area.